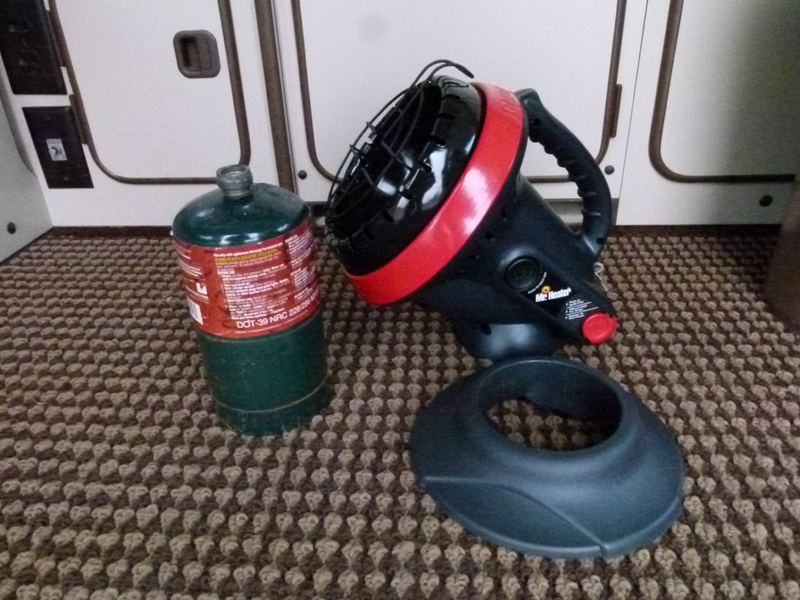 Camp Westfalia was provided with a free product sample in return for an authentic review of this product. All thoughts and opinions expressed here are those of Camp Westfalia, and are not otherwise influenced by the manufacturer or its affiliates. Vanagon and other van-travellers tend to wander off the beaten path, often finding themselves far from major highways, and perhaps beyond reliable phone reception. 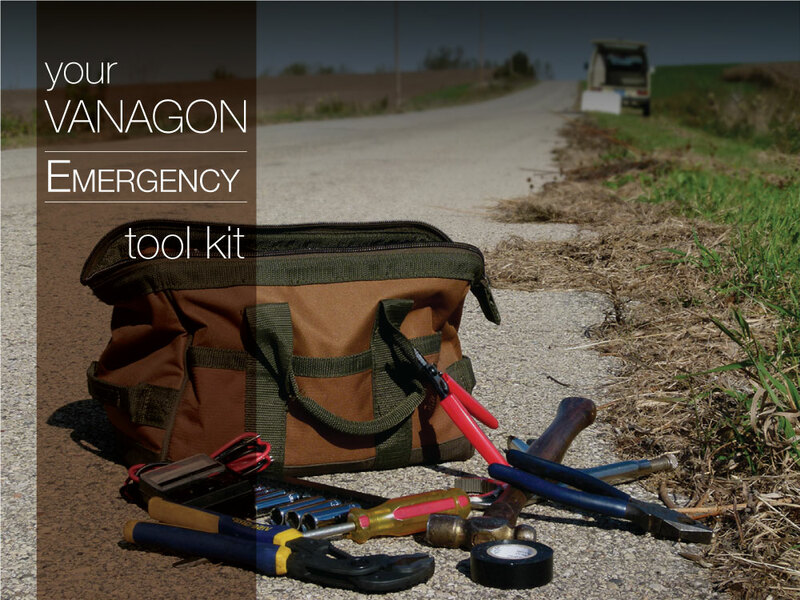 A flat or leaking tire on the interstate is a big inconvenience, but the same flat tire on a remote byway can be downright dangerous for you and your family. 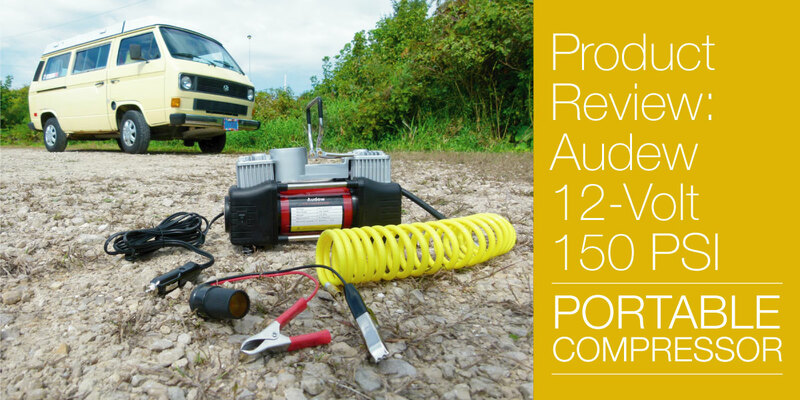 Self-reliance is crucial, and a portable compressor like this can be a real trip saver. This portable automotive air compressor is lightweight and surprisingly compact. But can it get the job done? When I first unboxed the Audew Double-Cylinder Air Compressor, I was a bit surprised by it’s small size and light weight. It seemed solid enough, but I wondered if such a diminutive device could properly inflate the larger, light-truck tires used on most Vanagons. Still, its cast alloy cylinder heads, main motor housing, and reinforced case all seemed to make for a pretty durable little unit. A folding top handle makes it easy to carry, and to lift in and out of the Vanagon bench seat. 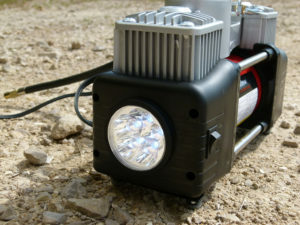 There’s an LED work light integrated into one end of the case, controlled by a dedicated switch, to shed some light on nighttime flats or other breakdowns. Unlike most other compressors of this size and price, this Audew Air Compressor model features twin cylinders, which evidently makes for higher pressures, faster inflation times, lower noise, and less vibration. 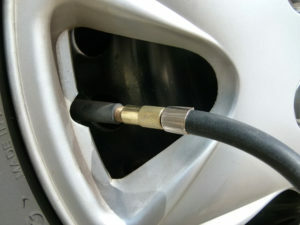 The primary power cord plugs into a cigarette-lighter socket. 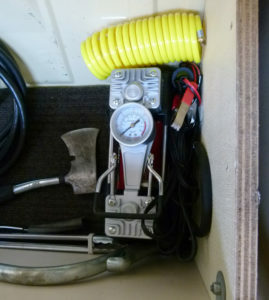 Also included is an adaptor to run the compressor directly off your main starting or auxiliary battery, a 10-foot coiled extension air hose, and three nozzle adaptors for inflating air mattresses, soccer balls, pool toys, etc..
Everything tucks neatly away inside the included zipper bag, to keep all the loose bits clean, undamaged, and organized. To simulate a flat tire, I pounded a 2-inch roofing nail through the sidewall of a low-miles Hankook. Just kidding. 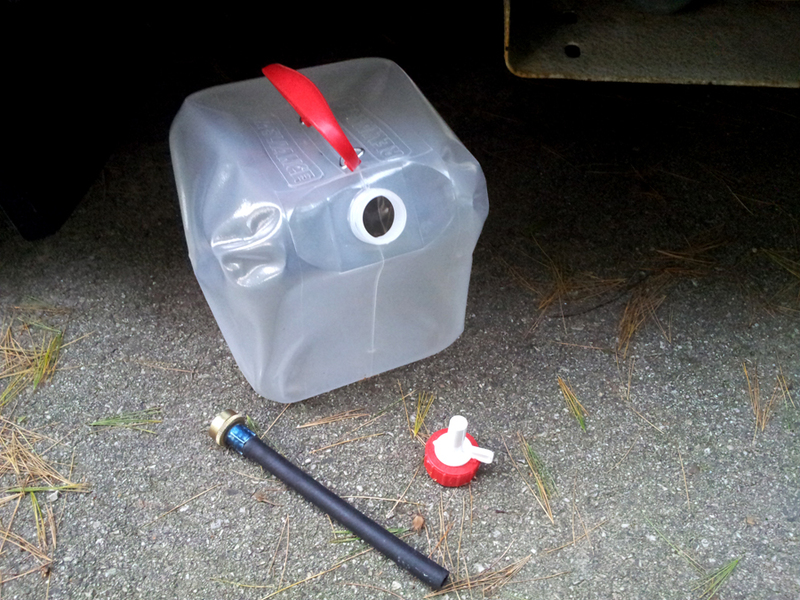 Actually, I just unthreaded the valve stem of my Vanagon spare and allowed it to completely deflate while I ate lunch. 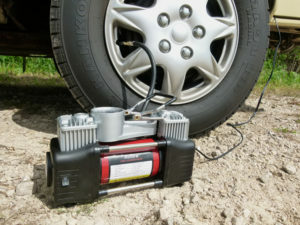 For maximum power during my test, I connected the Audew Double-Cylinder Air Compressor directly to my starting battery using the included clips. 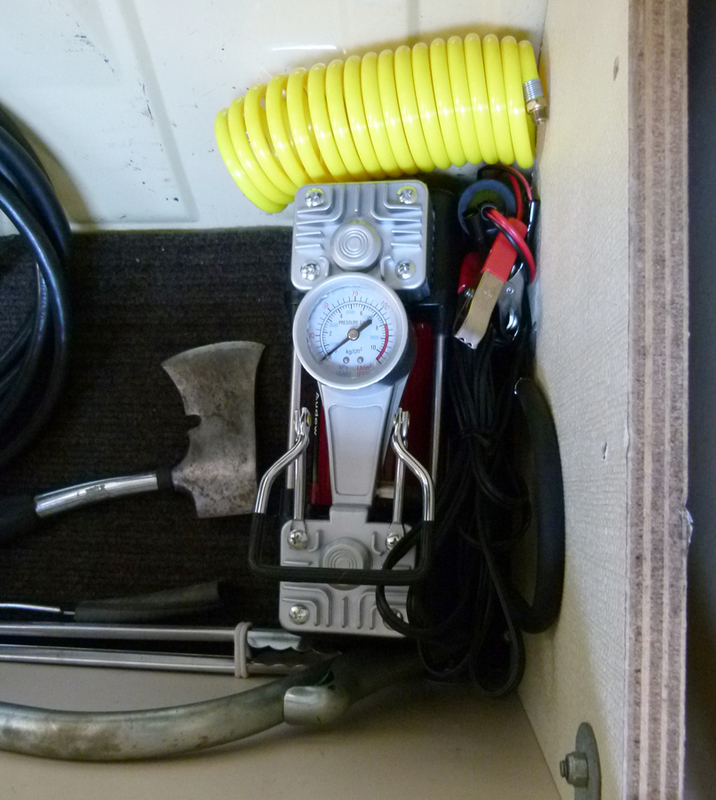 Both the primary air hose and the coiled extension use screw-on connections, so you don’t need to hold the hose onto the tire’s valve stem; just flip the switch and stand by. At 2 minutes, it had inflated the tire to 25 PSI. At 4 minutes, it had inflated the tire to 35 PSI. All in all, pretty speedy. NOTE: flat tires should always be inflated while bearing NO VEHICLE WEIGHT, to ensure the tire bead is securely seated on the rim, and so that the compressor is not over-working to lift the vehicle. Either jack the vehicle up so that the wheel is clear of the ground, or remove the wheel from the van entirely. Tires that are only a bit underinflated can be topped up while mounted. 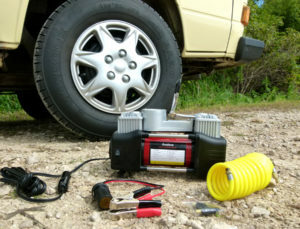 Using the 8-foot power cord and extension hose, all four Vanagon wheels are easily reached from the dashboard power socket. The included instructions warn users to allow the compressor to cool off after 10-15 minute’s use, but after completely filling my tire, I found the cylinder heads and motor casing only very warm to the touch. If inflating something larger like an air mattress, do it in 10-minute intervals to prevent overheating. 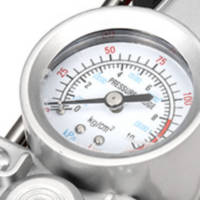 When compared to my shop-grade handheld pressure gauge, the compressor’s built-in gauge was accurate to within 1 PSI. Great review and certainly a must-have for those that wander the backroads. 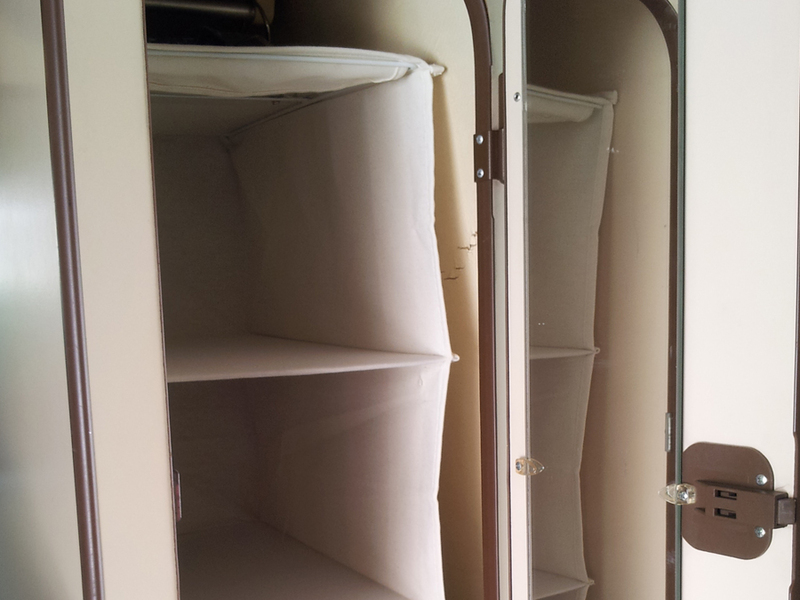 If I have one comment it’s that the Westy isn’t very spacious and adding to it with a compressor takes away from loading more valuable things like water or food or even clothing. With that said, wouldn’t a can of Fix A Flat give you the same security as the compressor? And, it’s much smaller and lighter. I’ve used Fix-a-Flat on a couple of cars over the years, and while it can be a trip-saver, it does have its drawbacks, including potentially imbalancing your tire, and its reliance on messy hazardous chemicals. Another use for a portable compressor is the ability to re-inflate your tires after “airing down” for better traction in sand or snow. And, of course, the ability to use it for other tasks like air mattresses, etc.. Things can get crowded in a Vanagon, especially when packed for an extended trip, so you’ll need to choose your gear wisely, depending on the nature of your travels.